The differences in the basic demographic trends for Hispanic and white students are most evident in primary schools, as are the differences in the distribution of students in existing and new schools. The changes evident in primary schools are particularly important because they portend the future of the nation’s public schools. As today’s primary school students grow older, the changes in their demographic makeup will be seen first in middle schools and then in high schools. High rates of immigration in the 1980s and 1990s produced an influx of young Hispanic adults in their prime childbearing years, and those immigrants proved to be highly fertile (Durand, Telles and Flashman, 2006). As a result, Hispanic enrollment in the nation’s public primary schools increased from 3 million to 4.6 million—a jump of 53%—from 1993-94 to 2002-03. Meanwhile, as the baby boom generation passed its prime childbearing years, the number of white children entering primary school was declining. 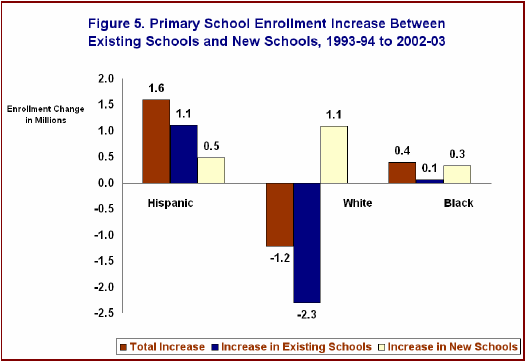 White primary school enrollment over that period dropped by 1.2 million, a decrease of 9%. The change in black enrollment in primary schools was more modest, increasing by 11%, or 392,000 students. Had it not been for the increase in Hispanic enrollment, the total number of students in primary schools would have declined by 560,000, or 3%. The growth in primary school enrollment, which was driven entirely by Hispanic students, was accompanied by an increase in the number of schools. A total of 6,500 primary schools enrolling about 2 million students were added between the 1993-94 and 2002-03 school years. During that time, the number of pupils attending existing schools declined by nearly 1 million. But the distribution of students among new and existing schools did not follow the underlying demographic pattern. Instead, there was a substantial shift of white students from existing schools to new ones. Of the 2 million students in new schools, nearly 1.1 million were white. Meanwhile, white enrollment in existing primary schools declined by 2.3 million students, or 17%. Although Latinos accounted for all the increase in total primary school enrollment since 1993-94, they constituted only 24 percent of the increased enrollment at the new primary schools; nearly 70 percent were educated in existing schools even as the total number of students in those schools was declining. In contrast, most of the 392,000 additional black students in primary schools attended new schools: 331,000, versus 61,000 enrolled at existing schools. The decline in white primary school enrollment and increase in nonwhite primary school enrollment since 1993-94 have changed the racial/ethnic makeup of primary schools. As Table 5 reports, primary school enrollment in the 48 states and the District of Columbia was 64 percent white in 1993-94; by 2002-03, it was 56 percent white. The decline in the white share of enrollment is mostly due to the rise in the Hispanic share, which increased from 14% to 20% over the period. The black share of enrollment went from 17% to 18%. In 2002-03, the racial/ethnic composition of the nation’s new primary schools was different from the composition of the existing primary schools. The 6,500 new primary schools were 58% white in 2002-03; existing primary schools were 56% white. The comparison understates the difference in racial/ethnic composition between newly opened and existing schools because it does not account for the schools’ locations. New schools tended to be in the larger states where Latino enrollment was burgeoning and white children were a lower share of enrollment. An examination of new and existing primary schools in the same region or state shows that new primary schools had significantly greater white shares of enrollment than existing schools. For example, new primary schools in California were 41% white in 2002-03, while the existing schools were 30% white. Hispanic enrollment also increased substantially in the nation’s middle and high schools from 1993-94 to 2002-03. But the addition of 1.3 million Hispanic students did not have as great an impact as in primary schools because white enrollment also increased by 1 million, reflecting the “Baby Boom Echo,” a burst of childbearing in the second half of the 1980s. Nonetheless, the growth rates are out of proportion. Hispanics contributed 40% of the growth in middle and high school enrollment from 1993-94 to 2002-03 but they accounted for only 12% of the students in 1993-94. Of the additional 1.3 million Hispanic students in middle and high schools over the same period, 920,000 (70%) were educated in existing middle and high schools. By comparison, of the additional 1 million white students, none of them was educated in existing schools. White enrollment in existing middle and high schools fell by 250,000.